Eleven students shared personal accounts of encounters with UPD that they allege led to medically unnecessary and costly trips to GW Hospital through EMeRG. One night last month, a female student was walking through the lobby of Thurston Hall after a night out with friends when she tripped over her shoes. University Police Department officers saw her stumble and she said they asked her questions to gauge whether she was intoxicated – all of which she answered correctly. Her blood alcohol level measured just above 0.02 percent – below the driving limit for adults of legal age – and low enough, she alleged, that officers argued about whether or not she needed to be sent to GW Hospital for medical treatment. Despite her objections, officers called for an EMS crew, and she was led away in an ambulance, she said. Once she got to the hospital, she said nurses gave her crackers, new socks and sent her on her way about 40 minutes later. She is one of 10 students who shared personal accounts and provided documentation of encounters with UPD that they allege led to medically unnecessary and costly trips to GW Hospital. The students, who all spoke on the condition of anonymity to preserve their privacy, said the root of the problem is open-ended University guidelines, which allow UPD officers to usurp medical evaluations by EMeRG or the D.C. Fire and Emergency Management Services and send individuals to the hospital. Several students said the forced trips to GW Hospital left them with roughly $1,000 hospital bills and feelings of frustration and alienation. Two said the incidents made them want to transfer out of GW. Officials were not able to comment on the specific claims made by students, citing privacy regulations. Tim Macchi, the vice president of public relations for EMeRG, a student-run organization offering emergency medical services on the Foggy Bottom and Mount Vernon campuses, declined to comment for this story. UPD policies require officers to contact EMeRG if students are clearly intoxicated or their health and safety is in danger. Signs of clear intoxication range from slurred speech, bizarre behavior and vomiting to unconsciousness, according to a copy of the procedure obtained by The Hatchet. But if the level of intoxication is not clear, officers must complete field sobriety tests and two breathalyzer tests. If a student’s BAC rises between the two tests, the officer must contact EMeRG, according to the policy. “Once EMeRG has been contacted about a member of the GW community on GW property, the officer has decided that medical evaluation is needed,” the document states. 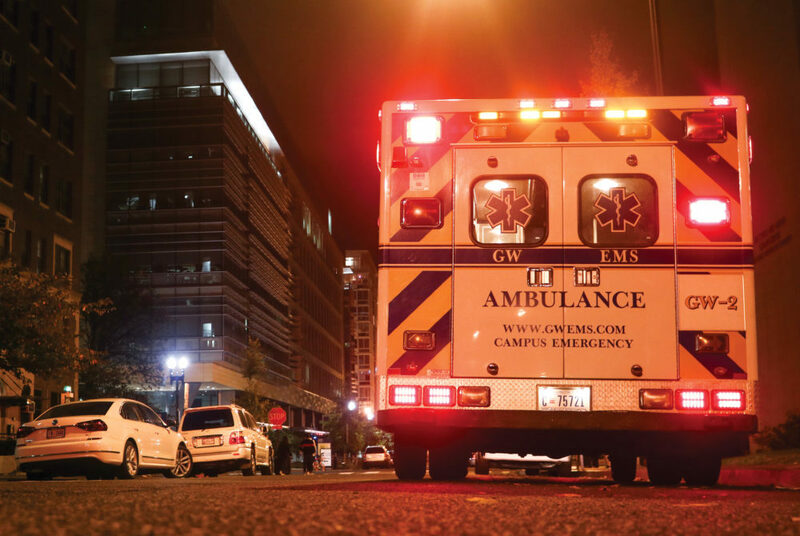 GW’s policy for transporting intoxicated students stands apart from many other universities with student-run EMS units, where emergency responders typically make decisions about medical treatment. For one male junior, a night at a comedy show in the Marvin Center ended with a trip to the emergency room during his freshman year. The student said he had about two drinks with his friends before the show, but before he got into the Marvin Center, his stomach felt queasy – what he thought was the result of a bad meal or too much stress – so he went to the bathroom in Phillips Hall and vomited, just as a UPD officer walked in. He said the officer knocked on the stall door and asked to speak with him. The student said he admitted to drinking earlier that evening. The student alleged that when he was later tested at the hospital, his blood alcohol content measured at 0.01 percent from a breathalyzer test – well below the legal limit for adults. “They take me to the hospital, and I had to ride in the ambulance. I honestly could have walked there,” the student said. Darrell Darnell, the senior associate vice president for safety and security, said UPD “strictly enforces” underage drinking and alcohol abuse laws. “These procedures are in place to protect the health and welfare of students and to reduce instances of abuse of alcohol that could lead to harmful consequences to the health of our students,” he said in an email. He declined to say about how many intoxicated students are EMeRGed by UPD officers each week, how often a student is EMeRGed who doesn’t think medical treatment is necessary or if anyone besides UPD has the authority to mandate that intoxicated students receive medical attention. Darnell also declined to say what happens if a student is brought to the hospital and a doctor later determines that it wasn’t medically necessary to bring them to the emergency room. A UPD officer, who spoke on the condition of anonymity because officers are not allowed to speak to the media, said by his estimation, UPD officers transport students who – even in the officers’ judgment – do not need to be hospitalized at least once a week. He said a lot of officers disagree with the policy because it instructs them to take students into protective custody and bring them to the hospital if medical professionals cannot or refuse to take them. He said hospital staff become frustrated when students who are only slightly intoxicated are brought to the emergency room, since they have other patients to attend to. “They’ll come in and basically run their credit card, and then they come out,” he said. Students hospitalized for intoxication who spoke to The Hatchet said their hospital bills ran up to $1,300. Two students, who filled out transfer applications to leave GW after their incidents, said their experiences with EMeRG caused their self-esteem to plummet and sent them into a state of depression. A fifth student waited for a friend outside Carvings by herself freshman year after a night of drinking and dancing at a club when she was approached by UPD, questioned and EMeRGed when she responded with slurred speech.